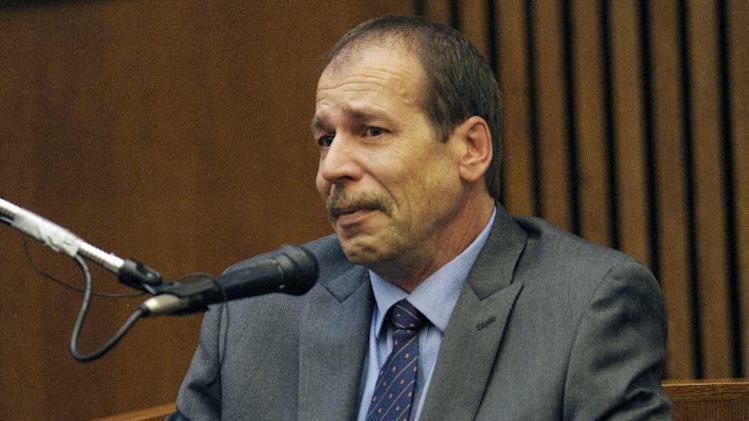 DETROIT (AP) — A jury convicted a suburban Detroit homeowner of second-degree murder and manslaughter Thursday in the killing of a drunk, unarmed woman on his porch last year, rejecting his claim that he was afraid for his life and had acted in self-defense. The jury convicted Wafer of second-degree murder, manslaughter and a gun-related charge after deliberating for about eight hours over two days. Wafer, who had been free on bond, was ordered to jail to await his Aug. 21 sentencing, despite the vigorous objections of his attorney, Cheryl Carpenter. He faces up to life in prison, but it's likely his punishment will be shorter. "We learned he was a cold-blooded killer," McBride's father, Walter Simmons, told reporters. "People have a right to bear their arms and everything else, but you have to do it with reason and responsibility," Simmons said. "Not just murder somebody when it's not justified." Jurors declined to comment after the hearing, and Carpenter couldn't immediately be reached for reaction. During closing arguments, prosecutor Patrick Muscat said McBride "just wanted to go home" the morning she was killed. "She ended up in the morgue with bullets in her head and in her brain because the defendant picked up this shotgun, released this safety, raised it at her, pulled the trigger and blew her face off," Muscat told jurors, holding the gun. "He armed himself. He was getting attacked," Carpenter told jurors. "Put yourselves in his shoes at 4:30 in the morning." Wafer is white and McBride was black, and some wondered in the aftermath of the shooting whether race may have been a factor, likening it to the shooting of Florida teenager Trayvon Martin. But the race angle faded over time and was hardly mentioned at all at the trial.